Top business litigators from across the country and distinguished in-house counsel from leading companies will converge in the Windy City this May for cutting-edge litigation education, networking, and fun. 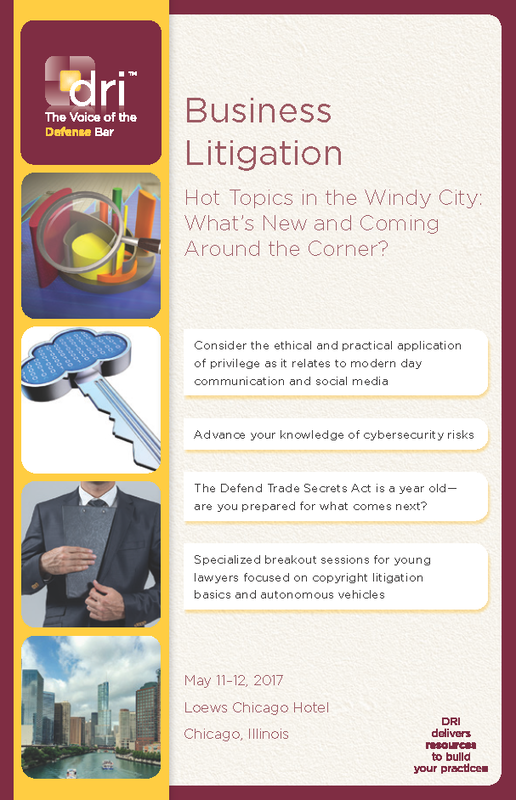 Besides picking up strategic insights, fresh legal developments, and litigation skills that will prove useful immediately and for the long term, you’ll have plenty of time to enjoy Chicago’s famous attractions: fine dining, the Magnificent Mile, blues joints, the Second City Comedy Club, Major League Baseball, and the city’s many museums and parks. As a bonus, our program will again offer “two for the price of one.” Members of DRI’s Intellectual Property Litigation Committee will be staying at the same hotel and hosting their seminar on emerging IP litigation issues at the nearby Gleacher Center. You are welcome to attend any session at either the Business Litigation or IP Litigation Seminars (your CLE credits will be offered through your Business Litigation Seminar registration).